"Sampath Speaking" - the thoughts of an Insurer from Thiruvallikkeni: millions of CFL bulbs.............. no light at the tunnel ... !! millions of CFL bulbs.............. no light at the tunnel ... !! In the recent Assembly elections in Rajasthan, Congress was drubbed – BJP won absolute majority securing 162 seats as against 21 of Congress ~ in the outgoing Chief Minister Ashok Gehlot's home district Jodhpur, BJP has won nine out of ten assembly constituencies, with Gehlot the only winning candidate of the Congress party. Sure we know - Thomas Alva Edison (1847 – 1931) a great inventor who changed the lives of people with his electric bulb and more including the phonograph, the motion picture camera. Edison is the fourth most prolific inventor in history, holding 1,093 US patents in his name, as well as many patents in the United Kingdom, France, and Germany. More significant than the number of Edison's patents, are the impacts of his inventions, because Edison not only invented things, his inventions established major new industries world-wide, notably, electric light and power utilities,sound recording and motion pictures. After passage of decades now it is stated that the incandescent light bulb is not very innovative. It hasn't changed much since Thomas Edison introduced it in 1879. Even today, it still generates light by heating a tungsten filament until it reaches 4,172 degrees Fahrenheit (2,300 degrees Celsius) and glows white-hot. Unfortunately, all of that white light is not very green. A good deal of electricity -- electricity from coal-fired powered plants responsible for spewing greenhouse gases into the atmosphere -- is required to make an incandescent bulb burn brightly ~ and now its existence is being threatened by compact fluorescent light bulb, or CFL, as its illumination comes by way of a much different mechanism. Instead of a glowing filament, CFLs contain argon and mercury vapor housed within a spiral-shaped tube. A compact fluorescent lamp (CFL), is a fluorescent lamp that uses one-fifth to one-third the electric power, and last eight to fifteen times longer. A CFL has a higher purchase price than an incandescent lamp, but can save over five times its purchase price in electricity costs over the lamp's lifetime.L ike all fluorescent lamps, CFLs contain mercury, a neurotoxin especially dangerous to children and pregnant women, which complicates their disposal. In many countries, governments have established recycling schemes for CFLs and glass generally. Here in Tamil Nadu, CM Jayalalithaa launched the first phase of providing free compact fluorescent light bulbs to over 14 lakh hut-dwellers in the state, an energy-saving measure aimed at saving 40 mw of power. Chief Minister Jayalalithaa also launched over Rs. 500 crore worth of projects under the Energy Department through video conferencing from her camp office at Kodanadu in the Nilgiris district. The scheme of providing free CFL bulbs was launched with an objective of promoting power-saving, a state government release here said. In the first phase of the Rs. 8.77 crore project launched on Monday, Ms. Jayalalithaa gave away one nine-watt CFL bulb to seven persons each marking its roll out, the release said, adding the initiative will help the government save about 40 mw. A total of 14.62 lakh domestic consumers coming under the hut-dwellers category will benefit with seven lakh of them being covered under the first phase, it said. But elsewhere……… Rajasthan's new chief minister Ms Raje finds the state in a mess with six million abandoned bulbs ordered by last government to help woo voters ~ all have the face of Gehlot on the box… !! Daily Mail reports that though his performance has been wiped out in the Assembly polls, perhaps the light has not gone out yet. The Bharatiya Janata Party (BJP) government has been left wondering what to do with around six million compact fluorescent lamp (CFL) bulbs worth Rs 66 crore, which were purchased by the former Congress government, led by Ashok Gehlot, for free distribution among the below poverty line (BPL) families and those living in hamlets and shanty dwellings. Giving the bulbs is ticklish as all of the covers carry the face of former CM and former power minister - Jitendra Singh. In his budget speech, Gehlot had announced the distribution of two CFL bulbs each to BPL families and those living in hamlets at a budgeted cost of about Rs 100 crore. Consequently, 12.5 million CFLs at the rate of Rs 107 per bulb were purchased for Rs 133.75 crore. The distribution work was supposed to be over before the Assembly elections. It has now emerged that around six million CFL bulbs - about half of the total purchased - couldn't be distributed, despite the fact that anybody who produced an electricity bill was given the CFLs, even in urban areas including the state capital Jaipur. 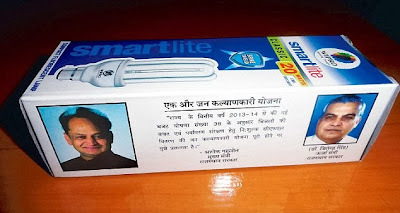 As the scheme was meant to win over the electorate in favour of the ruling Congress party, the suppliers were asked to print photographs of Gehlot and his power minister on the packages. Besides the CFL, more than 55000 laptops were given to students; these, tabs, bicycles and more did not turn the tide in his favour though ~ now so many bulbs are not providing any light !!! !